The city of Vijayawada is a place highly regarded for its culture, education, hospitality and entertainment. Being located on the banks of Krishna River, Vijayawada is one of the quickly developing urban markets of India. Here in Vijayawada the food processing sector makes an important contribution to the city’s economy. The city is receiving complete support from the government as officials asserted to provide all assistance for entrepreneurs who are willing to set up their processing units. Vijayawada’s food processing industry is booming in this ‘sunrise’ state of India. The state often described as the ‘rice bowl of India’ ranks 1st in the country for the production of mango, papaya, chili, turmeric, lemon and egg followed by fish and prawn production. The excellent fertility of soil makes the state the 2nd largest producer of paddy, groundnut and maize. The agricultural wealth significantly contributes to the GDP (Gross domestic product) and gives job opportunities to almost 65% of the state’s population. Along the Krishna river bed, turmeric, banana, sugarcane are grown abundantly as the alluvial soil here is best for the cultivation of these crops. There is increased productivity of other crops like paddy, maize, chilies, yam, banana and red gram in this type of soil. The set up of Central Plantation Crops Research Institute in Vijayawada is all set to give a massive boost and encouragement to the farmers’ of Kerala particularly cultivating coconut. At present 39.5 lakh acres of land is allocated for horticultural crops. The promotion of food processing sector in Vijayawada and the state is huge over the years. The government is developing infrastructural facilities like cold stores to help farmers and processors. There is a huge potential for entrepreneurs in this sector as high incentives are being given by the state government to start up food processing units. The development of value added food products of mango, banana, coconut, cashew etc is on the rise in this region, providing greater returns to the entrepreneurs. With the growing interest in the promotion of agro-food industries, a mega Food Park is being developed in the Krishna district. On World Food Day the Andhra Pradesh government signed a Memorandum of Cooperation (MoC) with 23 firms in food processing business. The MoC worth Rs 855 crore will generate employment opportunities for more than 25, 000 people. The state also envisages of creating 50,000 jobs by the year 2020. 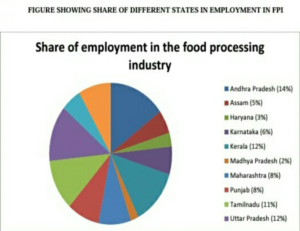 Andhra Pradesh has highest percentage of employees in the food processing sector. The food processing industry in and around Vijayawada is continuously facing difficulties due to inadequate processed raw materials and semi- skilled laborers. Though the infrastructural facilities are being developed, it is still a cause of concern. To achieve the vision of obtaining Rs 5,000 crore investments to the food processing sector by 2020 a lot is required to be fulfilled. The exploitation of crops like coconut, millets, mangoes, bananas and citrus foods is high. The wastage at post-harvest levels is reducing the quantity and quality of food being processed. Vijayawada region supports various food companies that are set up in this region for a flourishing business. Many companies producing pickles, processed cereals, beverages, baked food products are successful here. Some of them are Priya Pickles, Vaishnavi pulses and Food processing, Saibalaji Foods and Beverages etc.